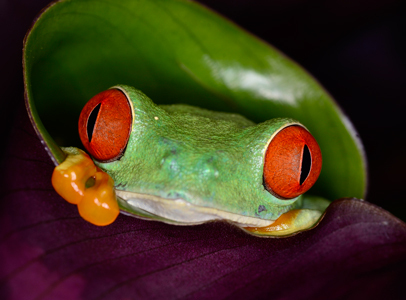 (Agalychnis callidryas) These are the classic tree frog, a sort of rainforest poster child! We have to have these at every shoot, they are outstanding subjects! 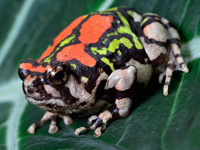 Hailing from the rainforests of Nicaragua, Costa Rica and Panama, these frogs are also captive bred in some numbers here in the US. 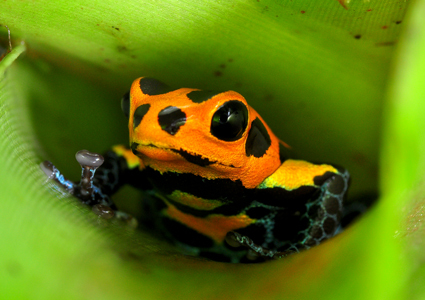 (Ranitomeya imitator) These tiny frogs are challenging subjects, due to their small size, but the results are worth it! Wow! (Nyctixalus pictus) These frogs occur in small populations, spread over the rainforests of Malaysia. Tadpoles of this frog develop in tree hollows and rotten logs. They have a lovely melodic call. (Theloderma corticale) These aquatic frogs live in rocky streams in Northern Vietnam. 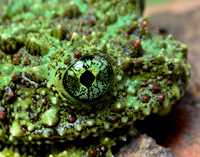 It’s coloration and highly textured skin make this a truly unique frog. Generally easy to work with and pose, so you will be sure to get some good shots of this one! (Scaphiophryne gottlebei) This small frog is hails from Madagascar, and spends most of its time buried in the earth. The area it comes from is hot and dry most of the year, and the frogs only emerge during wet seasons. Not much is known about the life cycle of this frog and it is one of the rare frogs we keep on hand that is not raised in captivity. 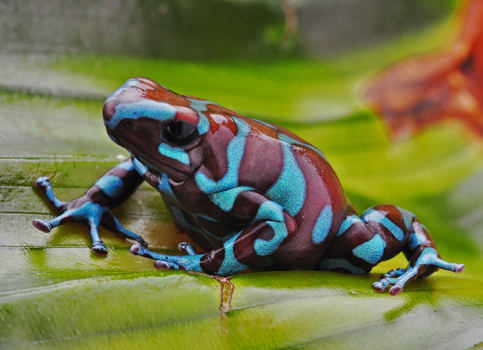 Incredible colors on these frogs! (Sphaenorynchus lacteus) These medium size frogs are South American in origin, zooming in close shows so much beautiful detail! (Phyllomedusa bicolor) These large South American Tree Frogs are great posers, they normally spend their day perched on a limb. Well known for their poisonous secretions, called “sapo” by local natives, who use the poison to elevate their senses for hunting and spiritual purposes. (Melanophryniscus stelzneri) One of the smallest toads I’ve seen, also one of the more strikingly marked. The matte black with the brilliant yellow over it is just beautiful, I think, and they are easy subjects, posing well! 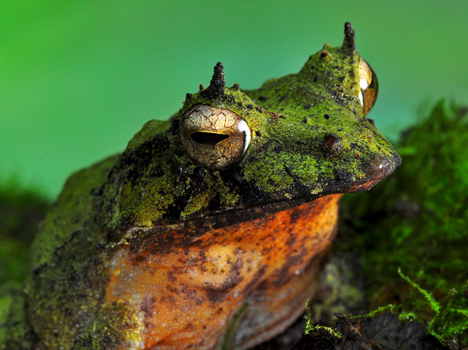 These amphibians hail from savannah type habitat in South America. (Ceratophrys cornuta) This frog presents a lot of different possibilities when it comes to macro shots, and it’s a great and easy subject to work with! 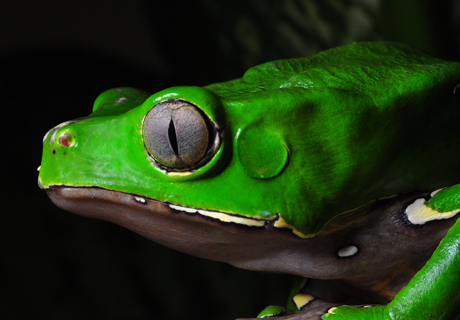 This frog lives on the forest floor in the Amazon, and is a classic “sit and wait” predator, eating anything he can get in his mouth! (Hyla Ebraccata) The Hourglass tree frog is fairly common in rainforests throughout Central America. 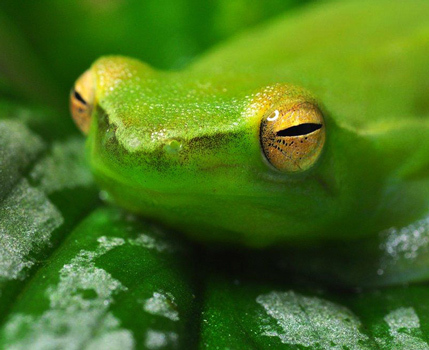 As with most tree frogs, they are nocturnal, and their large eyes help them to see during their night time foraging. They have a lovely pattern on the back as well as a beautiful face! (Ceratobatrachus guentheri) These frogs are another “sit and wait” predator, lurking amongst leaves on the forest floor waiting for an insect, lizard or another frog to come by and drop in for dinner…..Great subjects, look at those “horns” on the head! 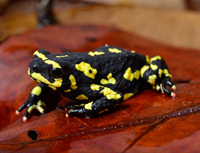 These frogs are quite variable, and we often have several of different appearances, including most notably a bright yellow form. (Hyla punctata) Not quite as transparent as their Central American cousins, these glass frogs are still pretty amazing looking. At night they turn this reddish color, but often during the day they show a pastel green with yellow spots. You’d never know they were the same frog, even the eye turns a different color, becoming more white. 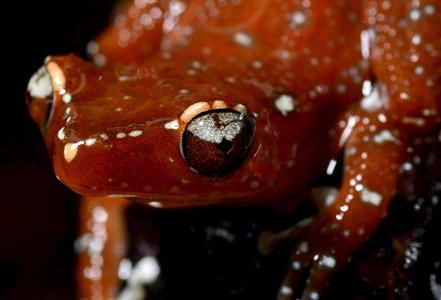 (Oophaga pumilio) This is but one of many forms of this frog that we work with here. These tiny frogs occur in a dizzying array of color forms throughout the Caribbean coast of Panama, Costa Rica and Nicaragua. 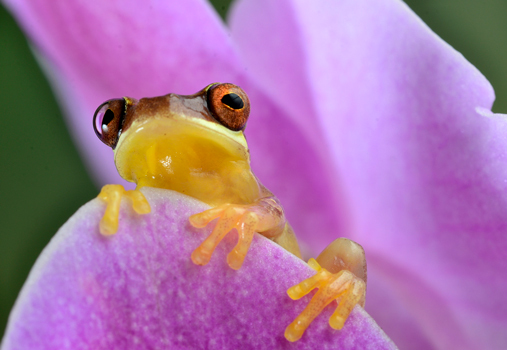 If you are so inclined I can offer you at least ten different color forms of these tiny frogs for your photo safari! 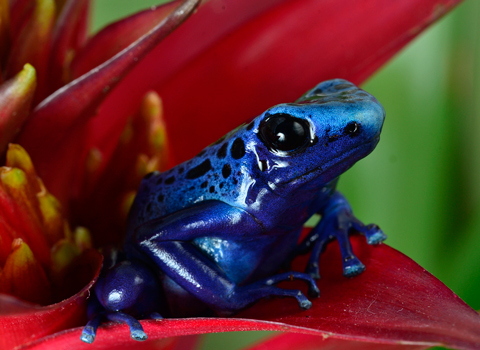 (Dendrobates tinctorius “Azureus”) The Blue Dart Frog has long been one of the most iconic of the “Dart Frog” family of rainforest frogs. 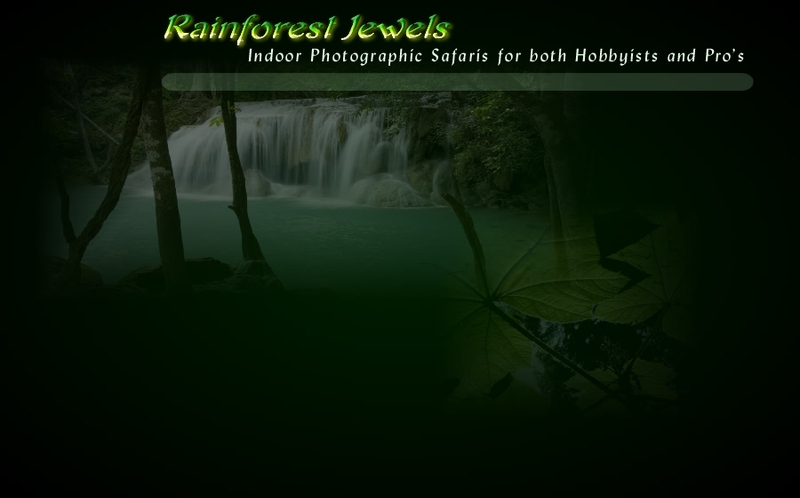 They hail from a remote area of Surinam, an area very rarely visited by humans. Here these frogs have existed for tens of thousands of years! Now they are bred in captivity in good numbers and their captive population doubtless outnumbers their wild population. Absolutely stunning frogs! (D. auratus) We often have two or three different forms of D. auratus, this one is unusual for its deep rich brown markings against the turquoise background. 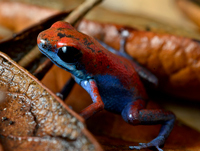 Dart frogs are fairly easy to shoot, especially these larger types. They are a little jumpy but will generally settle down and pose well!